Still looking for a Merseyside Exhibition venue. Any volunteers? 12-Oct-2018 If only those TBC dates for Merseyside could be agreed, and a venue, all would be better! We've still not finalised a Merseyside Exhibition so the stitchers from there in England have to make journeys far and wide to see their finished panels …. any volunteers? One destination has been The Garioch Heritage Centre at Inverurie which is currently hosting The Scottish Diaspora Tapestry until November 11th. 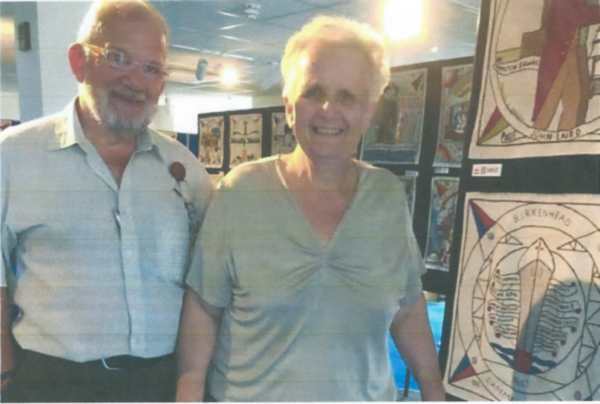 Several stitchers who helped create it have made the journey to Inverurie to view their handiwork in the Centre, but none have come as far as Colin and Sandra Spence [367.4 x 2 miles via M6], who made the trip up north from Birkenhead to see their panel. 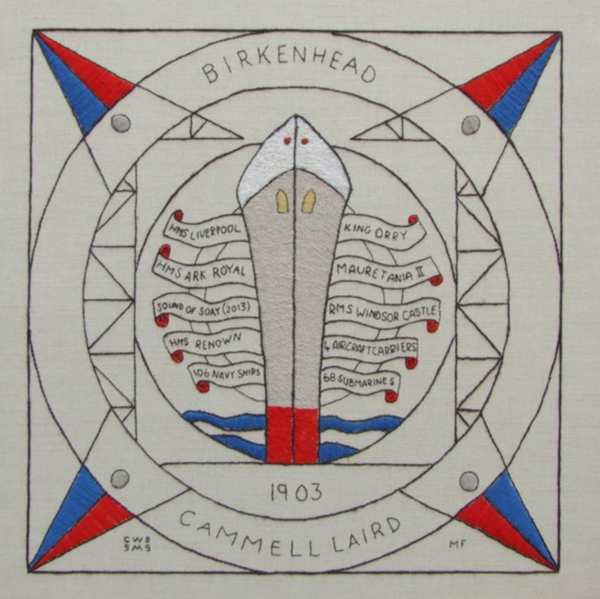 It's just besides them in the photograph, the Cammell Laird panel [GBE13]. They worked on it as members of the Liverpool & District St Andrew's Society with Muriel Forrest of St Helens and District Caledonian Association. As his father had, John Laird brought his sons into the business as partners. After his death in 1874 they continued to run the company, and in 1903 they merged with the Sheffield-based Johnson Cammell & Co which made vehicles for the London Underground. The Cammell Laird shipyard continued to produce high quality ships, including building for the Royal Navy warships, aircraft carriers like the massive HMS Ark Royal, and submarines. The yard was nationalised in 1977, returning as part of Vickers. In July 2013 the Cammell Laird yard launched the Sound of Soay, the first ship to be completed there for 20 years. Iain Laird a mhic a-steach don ghnìomhachas mar chom-pàirtichean, dìreach mar a rinn athair roimhe. An dèidh a bhàis ann an 1874, lean iad orra a’ ruith na companaidh agus ann an 1903 chaidh iad a-steach còmhla ri MacIain Cammell & Co stèidhichte ann an Sheffield, a bha a’ togail charbadan airson na rèile fo thalamh ann an Lunnainn. Lean gàrradhshoithichean Cammell Laird air adhart a’ togail shoithichean àrd-ghnèitheil, a’ gabhail a-steach togail shoithichean cogaidh don Chabhlaich Rìoghail, -giùlain itealain coltach ris an t-soitheach mhòr, HMS Ark Royal, agus bàtaichean-aigeil. Chaidh an gàrradh a thoirt fo chùram na stàite ann an 1977, a’ tilleadh mar phàirt de Vickers. Anns an Iuchair 2013, chuir gàrradh-shoithichean Cammell Laird S ound of Soay air bhog, a’ chiad shoitheach a chaidh a chrìochnachadh an sin airson 20 bliadhna.